You can limit search results to specific 'types' of locations. 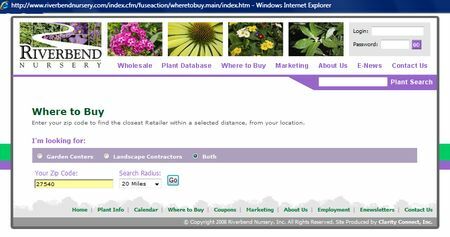 In this example, you can search for Retail Garden Centers, Landscapers or both. A quick zip code lookup allows customers to quickly find locations where they can purchase your products and/or services. The locations can be your own retail locations or those of your authorized distributors. This area will let your customers and prospects enter their US zip code to find locations nearest them including a choice for search radius in miles. The 'where to buy' locations can be easily mainted by you in your Clarity Console. If you maintain the list of locations in another application, we can create in import script to allow you to quickly update 'where to buy' locations. 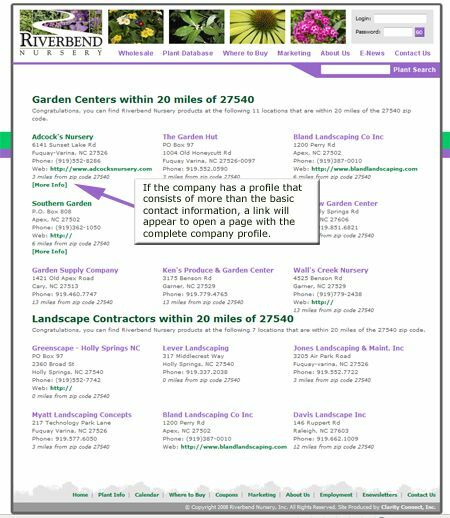 Typically, the results displays the basic contact info and website link. However, there can be additional information about that retail location, including hours of operation, map and directions, photos and more. We will work with you to implement the proper solution to help increase sales.